Whether you are a new track athlete, or experienced veteran, you’ll greatly benefit from using a pair of track spikes for your meets. Track spikes are feather-light and provide traction and stiffness to propel you through your events. With many events being decided by seconds or even tenths of seconds, you’ll want to have every advantage possible during your events. But choosing a track spike and getting the proper fit can be difficult. 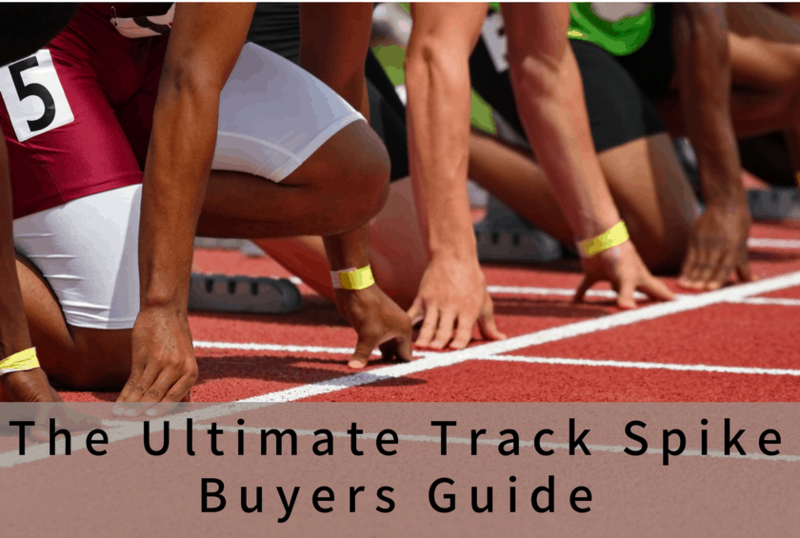 In this article, we’ll guide you through the steps to find the best track spike. 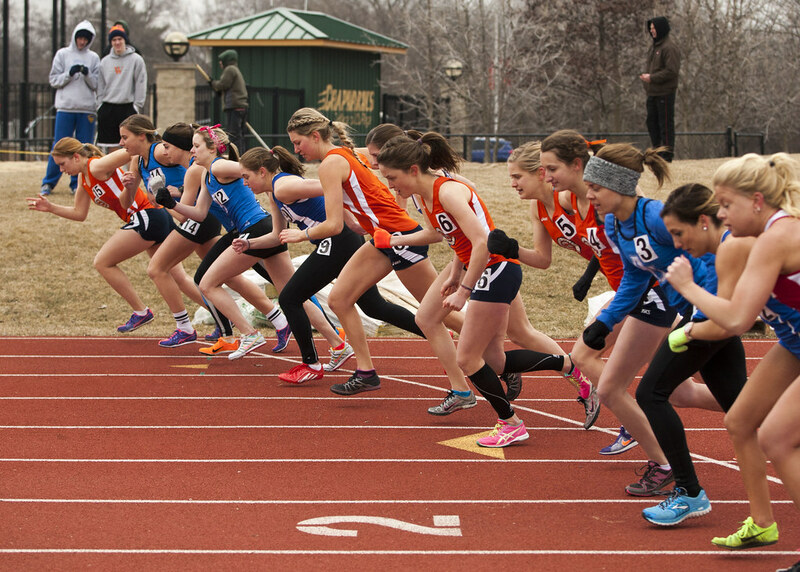 The first step to figuring out which track spikes you need is to determine the events you’ll be competing in. Different track spikes are made for various running distances. There are also other kinds of track spikes made for jumping and throwing events. In some cases, the same pair of spikes can be used across different events. But depending on the which events you do and how serious you are about competing, you may want to go with a specific spike for each event. Track spikes made for running events are broken down into 3 different types. These spikes have an aggressive and stiff spike plate that runs from the toes – where it’s the stiffest – to heel. 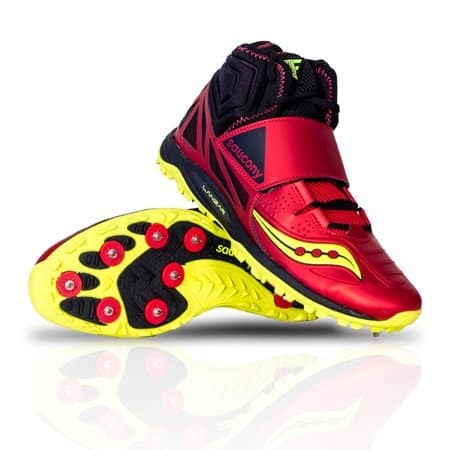 Sprinting spikes are designed for the 100 and 200 meters as well as 400 meters. The idea behind a sprinting spike is to keep a runner on their toes and provide the maximum amount of traction down the track. Most sprinting spikes feature 8 or more holes for the spike implements. In conjunction with a thick, stiff spike plate, the combination provides superior traction. They also have a contoured upper that locks the foot securely in place to prevent it from moving around. A good sprinting spike should cradle the foot while keeping it snug and in place. It has aggressive traction when a runner is on their toes. Mid-distance spikes are the most versatile of all the types of track spikes out there. They have a stiff and aggressive spike plate but offers enough flexibility to run both long and short distances. Mid-distance spikes have 6-8 spike holes. And while they are stiff, there is still some give and flex to the spike. It’s not as aggressive as a sprinting spike, but still provides enough stiffness to keep you on your toes. It also has a soft upper that keeps the foot in place, but stays light and nimble. Mid-distance spikes are ideal for the 800, 1500, 1600, and mile distances. But they can easily be used for events as short as the 400 or as long as the 2 mile. It can even be used for jumping events. If you are unsure about which events you’ll be competing in – or you do a wide range of events and only want to buy one pair of spikes – the mid-distance spike is you best option. Spikes made for the mile and two mile are essentially extreme racing flats. They are made to be light and nimble. You won’t find many spike holes, usually 4 – just enough for some traction on the turns. And the support is minimal. Instead, these spikes are feather-light to keep your turnover as fast as possible. Because they are so minimal, long distance spikes are only recommended for distances of 1500 meters or longer. They lack the support or aggressive spike plate for shorter events. There are two types of jumping spikes: high jump spikes and spikes for the pole vault, long jump, and triple jump. High jump spikes have spikes in the ball of the foot like running spikes – but they also have additional spike implements in the heel. This allows for better support and traction during the approach and plant. High jump spikes also provide a lot of lateral support on the upper of the spike. This is to keep the spike secure as you twist over the high bar. For runners new to the high jump, you can also buy a J Heel (link to amazon) that attaches to a mid-distance spike in the heel. This essentially converts it to the full spike plate found in a high jump spike. Long jump, triple jump, and pole vault spikes have a thin spike plate to provide traction on the runway, but also to allow for extra support during take-off and landing. Both types of jumping spikes are highly specialized and should only be used for jumping events. 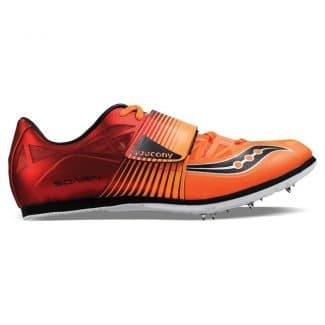 You’ll get a huge benefit from using these specialized spikes, but they are better options for seasoned athletes committed to jumping. 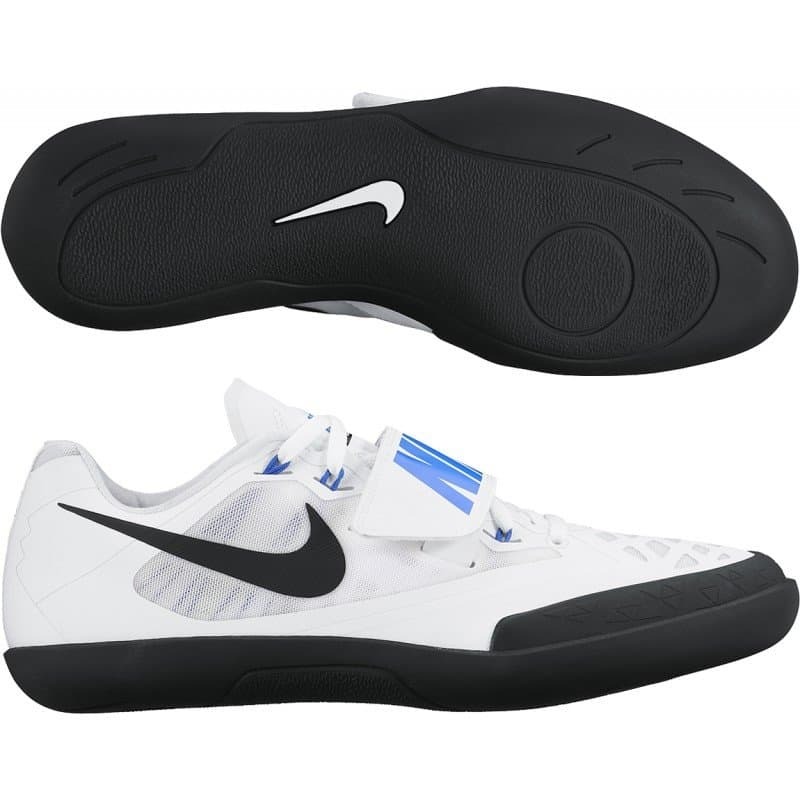 Track shoes designed for the shot put and discus are made without spike implements. Instead, they are built to provide grip (for the shot put) and spin for discus. They also feature supportive uppers to keep your feet locked in place. Javelin spikes are boots with a full-length spike plate to provide traction during the approach and a solid plant as you throw. The boots tend to be fairly heavy with a secure upper to keep the foot supported. In order to fully benefit from track spikes, it’s important to get the proper fit. When trying on spikes, they should feel secure without cramping. Your toes should be close to the front of the spike without actually touching. Unlike trainers where you want some room between your toes and the front of the shoe, with track spikes you want them tight. One thing to keep in mind if you’ve never worn track spikes before is that they are not going to feel as comfortable as your trainers. Track spikes are built to secure your foot and provide traction. They aren’t built for comfort. Your foot shouldn’t be cramped or uncomfortable in a spike, but they will never feel as good as a running shoe. One issue we’ve noticed fitting athletes for spikes is that they run narrow. Partly, this is because spikes should be snug and fit securely. Partly, it’s a shoe company’s decision because most manufacturers don’t see the need to make spikes in wide widths. So if you have a wide foot, what should you do? A shoe gets wider the bigger it gets. One option is to size up. The problem is that while you might get the width you need, your foot will move around more and potentially slipping in the heel. You may not be used to wearing shoes that are longer than what you are used to as well. Altra running shoes have a foot-shaped design, resulting in a very wide toe box. The Golden Spike is their cross country spike that accommodates a wider foot. The concern for some track athletes is that this is a cross country spike, not a track spike. It’s bigger, heavier, and has more cushioning than a track spike. It works pretty well for mid and long distance runners; however, it doesn’t have the same level of stiffness or support for other events. There is a wide range in price between different track spikes. A good, basic pair costs about $65 while the best models are closer to $120-$150. Typically, the differences come down to weight and spike plate. On sprint and mid-distance spikes, the budget versions often have fewer places for the spike implements and less aggressive traction on the plastic parts of the spike plate. The upper tends to be made of heavier material that doesn’t support the foot as well as high-end spikes. For long distance spikes, it comes down to weight. 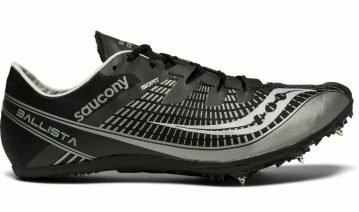 An aggressive spike plate is less important for the mile and longer events, so more expensive shoes use better material in the upper and midsole to lighten up the shoe. The metal spikes that screw into the bottom of the track spike come in a variety of styles and lengths. The default spike that comes with a track spike shoe is 1/4 inch pyramid. This is the most versatile spike and should work on most track surfaces (and for XC meets as well). 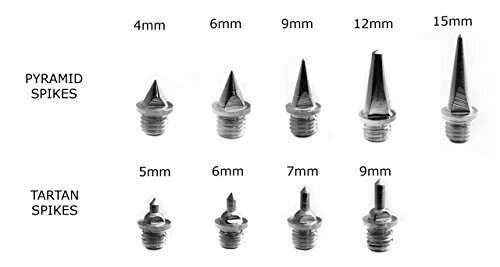 But spikes also come in 1/8, 3/16, 3/8 inch lengths. Often 1/8 and 3/16 inch spikes are used with all weather, rubber outdoor tracks and on indoor tracks. Always check with your coach about what length spike to wear at specific meets. Spikes differ in shape as well. Pyramid is the most common. Needle spikes are thinner and good for rubber tracks where they stick to the track surface. Christmas Tree spikes are for rubber tracks where you don’t want to “stick” to the surface. Tartan spikes are dull and prevent even less sticking. Finally, blanks or studs are flat and should be worn when you don’t need or want any extra traction. They are designed to cover the spike holes in the shoe to keep out debris. 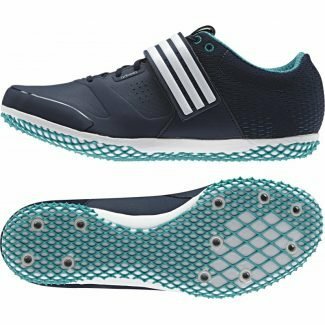 Can you use cross country spikes for track? In most cases you can use cross country spikes for track. In fact, where I live in New York, athletes are required to wear rubber-bottomed spikes (i.e. XC spikes) for most of their indoor winter meets. The indoor tracks in the area get a lot of use and the rubber-bottoms on XC spikes help preserve the track surface. But your seriousness as an athlete – and the events you do – will also determine if this is right for you or not. Cross country spikes are heavier and have more cushioning than track spikes. They also lack the stiffness and aggressive spike plate found in sprint and mid distance spikes. They work fine for long distance events (if you are ok with a heavier shoe). But for mid distance, and especially sprinting, events, you lose the stiffness that will keep you on your toes during those events. What about track spikes for cross country? We wouldn’t recommend this. Track spikes lack the cushioning and durability needed for 5k meets across grass, dirt, and other obstacles. A long distance spike would get torn apart during most track meets. 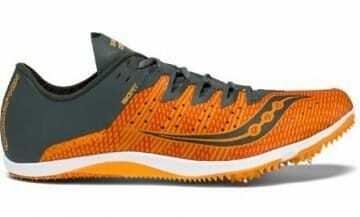 And sprint and mid distance spikes would be too uncomfortable to wear over 5 kilometers. Blanks or stud spikes protect the screw threads when you don’t need any sort of traction from spike implements. They are best used on indoor tracks and especially during cross country when you have meets with lots of pavement. Can you wear track spikes on concrete? It’s not recommended to wear track spikes (with the implements in) on concrete. You’ll slide around and won’t gain any advantage. 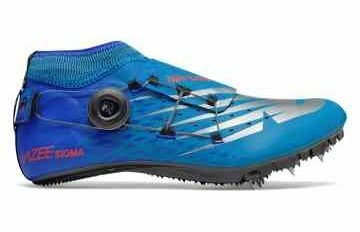 A better option is to wear cross country spikes with blanks in the spike holes. Can you sharpen track spikes? No, once a track spike dulls and loses it’s traction, it’s best just to replace it. A spike will more likely break if you try to sharpen it. And you can buy replacement spikes for minimal cost. What track spikes do Olympians wear? Olympians wear track spikes from all the major manufacturers like Nike, New Balance, and Brooks. It’s fun to see what the elites are wearing and get the same spikes, but in reality these athletes are sponsored and receive money to wear a specific brand. In all likelihood, a track athlete is only wearing a certain spike brand because they are paid by that company to do so – not because that’s the best spike for their foot. When fitting track spikes, you should choose what feels most comfortable. Not what your favorite athlete wears. How to remove track spikes that are stuck? Usually, the track wrench that comes with your track spikes is enough to get out a stuck spike. If it’s really stuck in there, take a pair of pliers and grip the spike near the base. This should give you enough leverage to get out the stuck spike. If the spikes are worn down to their base, try this trick and use a hacksaw to create a groove that you can then get a regular screwdriver in.